New solvent blend which safely and effectively removes graffiti from plastic and polycarbonate surfaces without damage – will not cause blooming or the surface to turn opaque. Surfactant system allows a unique “wash off” rinse away property so preventing residue waste on the surface. Low viscosity ensures quicker and more effective surface penetration than traditional gels. 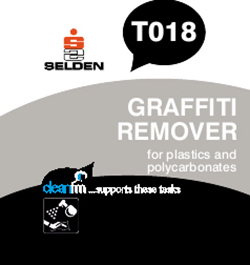 Advanced graffiti remover suitable for use against aerosol paint yet will not damage polycarbonate and plastics. Spray onto graffiti. Allow sufficient time to penetrate. Wash off with plenty of clean water. Do not allow neat product to dry on surface.